Yay or nay? I say, why not! I first saw Paul & Joe cosmetics in Japanese magazines and instantly fell in love with their pretty designs. So different from the ubiquitous, black boxy stuff you see in other cosmetics brands. I don't buy much cosmetics but when I do, I choose ones that are unique in design because that will get me excited whenever I use them. Well, they'll have to work well on me, too, of course. 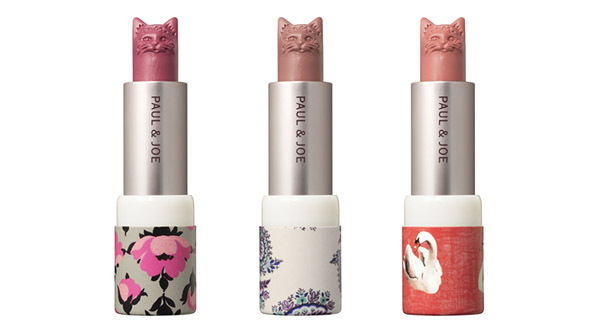 Anyway, I've been following Paul & Joe's releases, and when I saw these cat lipsticks, my jaw dropped. Check out their color palettes from the same collection, too, here. They're all so pretty! I don't wear lipstick but if I had to buy some for a special occasion, I would totally buy this. It's awesome!